Yesterday, MSNBC's Lawrence O'Donnell and his guests analyzed what's been called the "Finger of Fury" that Arizona Gov. Jan Brewer wagged at President Obama in a heated conversation over immigration policy. 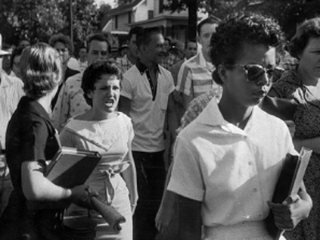 Melissa Harris-Perry said the image reminded her of the famous 1957 photo of Elizabeth Eckford and Hazel Bryan. Taken as black students made their way into the newly integrated Little Rock Central High School, it catches Hazel in the middle of yelling at Elizabeth to "go back to Africa." Harris-Perry said she was reminded of the photo not because the meeting between Brewer and the President depicted racial tension … but because Hazel later confessed to having been sort of “caught up in the frenzy” of the moment and “enjoyed the show” of being able to yell at Elizabeth. Gov. Ed Rendell had a simpler take on the incident, saying, "If you're there, you treat the president with respect. You don't point a finger in his face … It's dumb and it's disrespectful."